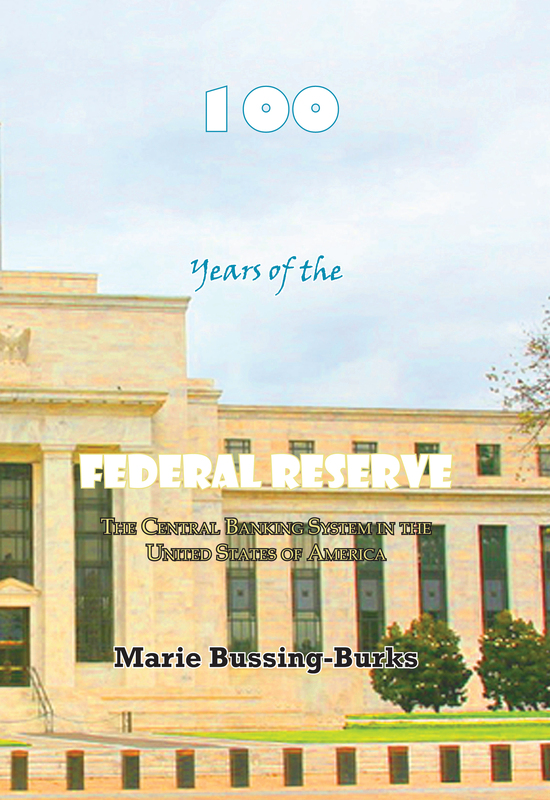 100 Years of the Federal Reserve: The Central Banking System in the United States of America ($15 – Click to Purchase, January 2012, ISBN: 978-1-937536-17-6, Hardcover ISBN: 978-1-68114-175-6, 6X9”, 70pp): Finally a book about the Federal Reserve targeted for young readers. This book should help middle and high school students understand the U.S. economy and society better at a time when recessions, bank failures, and the growing deficit are regularly in the news. 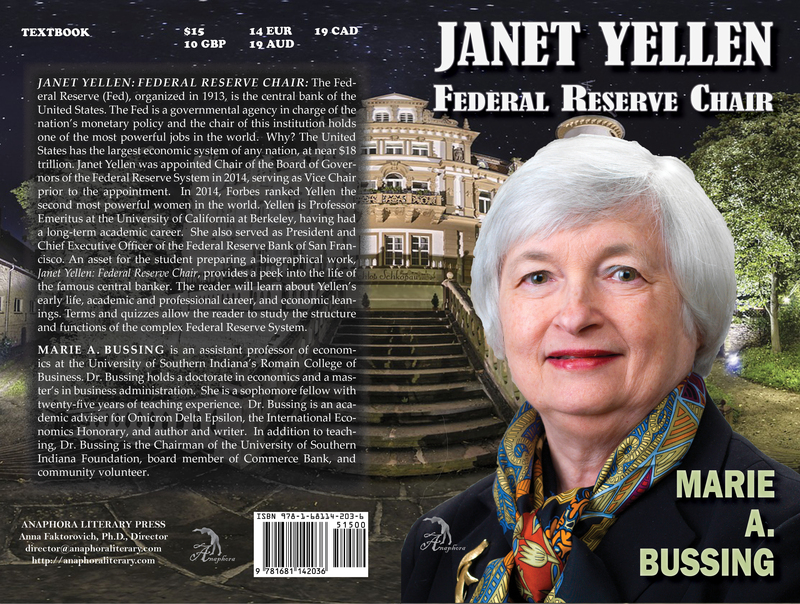 The book celebrates the 100th anniversary of the American Federal Reserve system. Janet Yellen: Federal Reserve Chair: ($15, 48pp, 6X9″, Print ISBN: 978-1-68114-203-6, EBook ISBN: 978-1-68114-204-3, LCCN: 2015915329, September 2015; Purchase on Amazon or Barnes & Noble): The Federal Reserve (Fed), organized in 1913, is the central bank of the United States. The Fed is a governmental agency in charge of the nation’s monetary policy and the chair of this institution holds one of the most powerful jobs in the world. Why? The United States has the largest economic system of any nation, at near $18 trillion. Janet Yellen was appointed Chair of the Board of Governors of the Federal Reserve System in 2014, serving as Vice Chair prior to the appointment. In 2014, Forbes ranked Yellen the second most powerful women in the world. Yellen is Professor Emeritus at the University of California at Berkeley, having had a long-term academic career. She also served as President and Chief Executive Officer of the Federal Reserve Bank of San Francisco. An asset for the student preparing a biographical work, Janet Yellen: Federal Reserve Chair, provides a peek into the life of the famous central banker. The reader will learn about Yellen’s early life, academic and professional career, and economic leanings. Terms and quizzes allow the reader to study the structure and functions of the complex Federal Reserve System. Marie Bussing-Burks: holds Master of Business Administration and Doctorate of Arts in Economics degrees. She is an Assistant Professor of Economics in the College of Business at the University of Southern Indiana. Bussing-Burks is the author of six other books: Starbucks: Corporations that Changed the World, Money for Minors: A Student’s Guide to Economics, Influential Economics, Profits from the Evening News: Using Leading Economic Indicators to Make Smart Money Decisions, and The Young Zillionaire’s Guide to Taxation and Government Spending. In addition, she has more than 30 magazine, newspaper, and journal articles to her credit.